532 pages | 1 B/W Illus. Although most children learn language relatively quickly, as many as 10 per cent of them are slow to start speaking and are said to have developmental language disorder (DLD). Children with DLD are managed by a variety of different professionals in different countries, are offered different services for different periods of time and are given a variety of different therapeutic treatments. To date, there has been no attempt to evaluate these different practices. 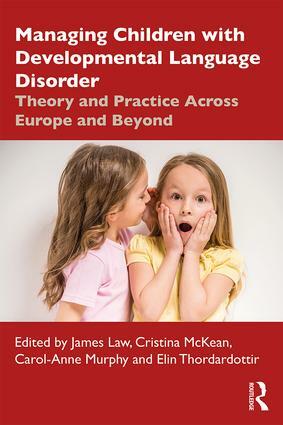 Managing Children with Developmental Language Disorder: Theory and Practice Across Europe and Beyond does just this, reporting on the findings of a survey carried out as part of the work of COST Action IS1406, a European research network. Law and colleagues analyse the results of a pan-European survey, looking at how different services are delivered in different counties, at the cultural factors underpinning such services and the theoretical frameworks used to inform practice in different countries. The book also provides a snapshot of international practices in a set of 35 country-specific "vignettes", providing a benchmark for future developments but also calling attention to the work of key practitioners and thinkers in each of the countries investigated. This book will be essential reading for practitioners working with children with language impairments, those commissioning services and policy in the field and students of speech and language therapy. James Law studied linguistics, practising as a speech and language therapist in the UK for ten years, and is currently Professor of Speech and Language Science, Newcastle University, UK. Having received over £5 million in research grant funding, his main focus has been on children’s language development over time and the science underpinning interventions to ameliorate developmental language disorders. Cristina McKean is a speech and language therapist and senior lecturer in speech pathology at Newcastle University, UK. She is honorary fellow at the Murdoch Children's Research Institute and adjunct fellow at the Menzies Institute, Griffith University, Australia, and editor-in-chief for the International Journal of Language and Communication Disorders. Her research aims to understand individual differences in child language development, the drivers and processes of developmental change and the effects of interventions and service delivery models on children’s trajectories. Carol-Anne Murphy lectures in speech and language therapy at the University of Limerick (UL), Ireland. She leads the child speech, language and communication needs research group at UL, whose work includes the development of school-based speech and language therapy services. Carol-Anne has a particular interest in understanding mechanisms of intervention, effective approaches to assessment, and intervention implementation in developmental communication difficulties, particularly developmental language disorder. Elin Thordardottir, a certified speech-language pathologist and audiologist, conducts research and teaches in Canada as a professor at McGill University, and in Iceland, at the Academy of Reykjavik and the University of Iceland. This allows her to study typical language development and impairment in monolingual, bilingual and multilingual children in distinct linguistic environments and with a strong cross-linguistic focus. She has authored a number of clinical language measures in Icelandic and French.